International Conference on Multidisciplanary Research, Practices & Studies (ICMRPS-2018), A P Goyal Shimla University, Shimla (H.P. ), India. 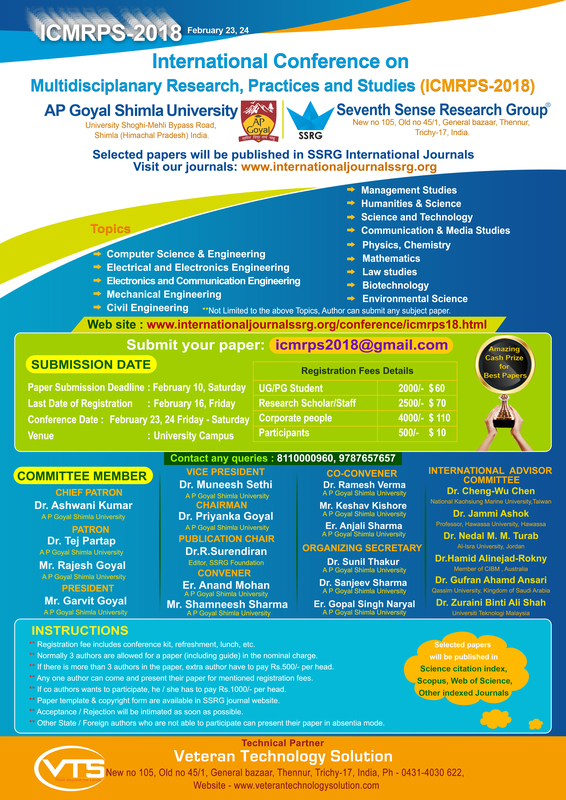 The aim of ICMRPS-2018 is to bring all the research domains together on a single platform. This conference will bring the research communities of different fields together at one place to share their researches and ideas. Also the purpose of this conference is to implement the researches of one field into another to bring out the best applications of these researches. ** If co authors wants to participate, he / she has to pay Rs.1000/- per head. One of the best places to visit in Shimla is the Summer hill – a picturesque township is located 5 km from the famous ridge of Shimla. This hill is carpeted by rich greenery that offers breathtaking views from the top. Summer hill is also a part of the 7 hills that make Shimla, so it is sure to leave you overwhelmed by its beauty. Built by the British, IIAS is primarily the summer retreat of Indian President. It was passed on to the nation by the then president Dr Radhakrishnan as an institute to promotes advances studies in humanities and arts in India. The building is a classical architectural design with proficient fire proofing system. A visit into the institute is actually a walk through the modern Indian history. Annandale has to be on the list of places to visit in Shimla. This place was home for a number of adventure sports during the British rule including racing. However, now, this place is just perfect for all the golf lovers out there as the racecourse has been converted to a mini golf course, which also serves as a helipad and offers incredibly beautiful sceneries of its meadows. Believed to be the highest peak in Shimla, this hill is 8000 feet high and is a major tourist attraction in Shimla. This temple is a heaven for all the nature lovers and pilgrims who come to visit the historic 108 feet tall Hanuman statue at the Jakhoo temple. It is almost a short trek for adventure seekers. Popularly known as the Scandal Point, this flat spacious platform is one of the most popular places to visit in Shimla. It is a complete treat to all the mountain lovers with all the mesmerising views of the valley and the snow capped mountains surrounding Shimla. Apart from the breath taking view, this place is also home to the famous Tudor library. The platform offers marvellous spectre of sunset and sunrise. The Shimla state museum also known as the Himachal state museum and library is located on Mount Pleasant. The sprawling lawns and the brilliant British architecture makes this place totally worthwhile. The museum amazingly displays the glorious past of the state with its rich culture and heritage. They have an incredible collection of different artefacts, paintings, sculptures, handicrafts and a lot more which they have been preserving since ages. Naldehra is one of the best places to visit near Shimla as it offers the most picturesque sunrise and sunset views. With dense deodar trees and naturally rich flora and fauna, this place has amazing forest cover to be enjoyed on a horse ride. The stunning view, calmness and fresh air is sure to leave anyone spellbound. One of the major tourist attractions of Shimla, Chadwick falls, falls from an altitude of 1586 meters. With dense forest, lush deodar and pine tree surrounding it, the view is totally enthralling. The monsoons lead to an increase in the water level of the falls making the place even more beautiful with its sparkling water. Chadwick falls is surely a treat to one’s eyes with its captivating beauty and ambience. Of all the Shimla tourist places, Mall Road is one place, which you ought to visit during your holiday. This famous street is a haven for Shopaholics and everyone alike. From warm woolens to beautiful handicrafts, one can find anything here at reasonable prices.